We never punish (a people) until we have sent a messenger. (Al-Isra, 17: 16). My brothers and sisters, reflect well. From the beginning of this year 2018, Mauritius is going through a difficult situation. When you think that from the first day of the New Year (01 January 2018) a great accident happened where two brothers died, and then the next day an ex-husband killed his ex-wife with a revolver (when she came to visit her child in the home of the ex-husband) and then killed himself. Since the 1st of January, the rain has not stopped falling; heavy downpours except on Sunday 07 January 2018. 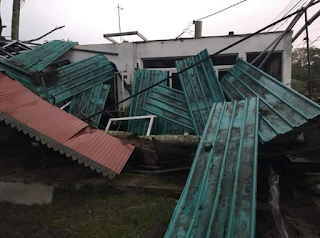 At the beginning of the school activities for the new year, on 08 January 2018, heavy rainfall continued to flood, destroying the agricultural fields (fruits and vegetables) and amenities of thousands of houses and cars. Then a dangerous cyclone, named Berguita, came to make matters worse since Tuesday 16 January until 18 January 2018 and for the first time in Mauritius (after many years) more than five thousand people, men, women and children have gone to seek refuge in the shelter centers, leaving their homes and all their furniture, food and other amenities, taking only their own persons and their family members to shelter from the cyclone. Social workers and even the government only distributed biscuits and bottled water to support all those people. After the passage of Berguita, vegetables and fruits have almost disappeared from the shelves of the markets and for the fruits and vegetables remaining, prices have skyrocketed and it has become very difficult for the Mauritian nation given the rise in prices at all levels. These torrential rains, lightning and cyclone Berguita caused quite a lot of damage nationwide, blocking drains/ canals, flooding the streets and destroying cars too. Afterwards we saw a lull in the density of the rains in some parts of the country, but in other regions the rain did not cease to cause misfortunes. 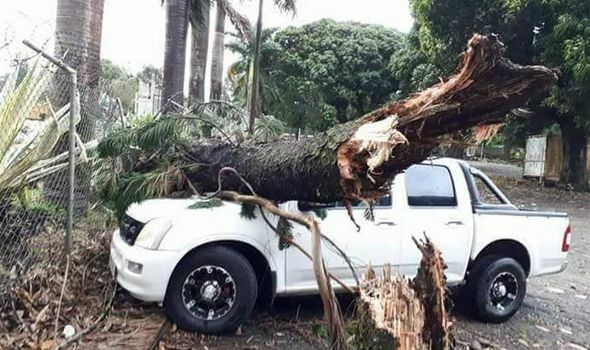 The situation became alarming when on Wednesday and Thursday, 24 & 25 January respectively, the notice/ warning of heavy rain forces the government and the organizations concerned to close schools, universities and even some workplaces. 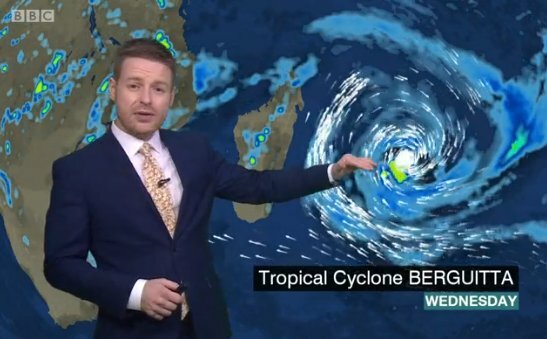 The panic was felt here in Mauritius with the rising waters and the continual torrential rain. Given the situation, the Ministry of Health advised people to boil water before drinking to stay healthy and avoid diseases such as gastroenteritis and other health problems. Despite the precautions many have also caught conjunctivitis. It is impossible for me to list all the problems that Mauritius is facing because our little island is consecutively going through trials. Hadhrat Munir Ahmad Azim Saheb (atba) of Mauritius, the Divinely-raised renewer of spirituality in our times (Muhyi-ud-Din/Mujaddid), and the Holy Founder of the Jamaat Ul Sahih Al Islam, often goes on Da’wah journeys to distant places in various countries. 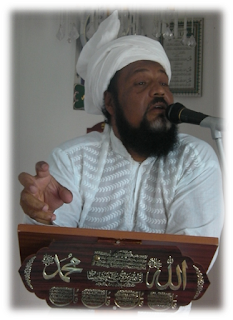 The purpose of these spiritual voyages is to convey the essence of the Sublime message being vouchsafed to him from the Unseen through pious dreams, true visions and Divine revelations. Like all Divine servants who preceded him throughout Islamic history, Hadhrat Saheb’s mission- the Jamaat Ul Sahih Al Islam- strives to urge people to embrace a life in awe of the Exalted Almighty, the unique and singular God through finding the beauty of equity and virtuosity in all spheres of everyday life; performing good deeds in service of fellow beings, regardless of their station and status in society. 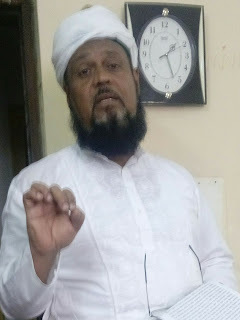 Inspired by this personal example of their beloved Imam (atba), Hadhrat Saheb’s disciples in India also go on Da’wah journeys, whenever opportunities present themselves. 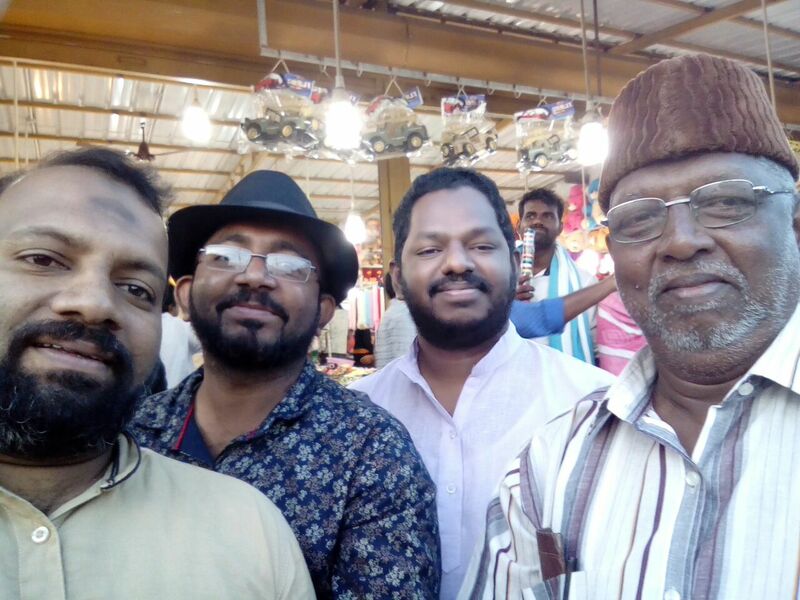 In a recent such episode, Mukarram Amir R. Jamaluddin Saheb of the South Kerala Jamaat, accompanied by brothers Sulfikar Ali Saheb and Sadiq Ali Saheb of Kaliyikkavila, visited the border areas of Kerala-Tamil Nadu and went all the way to Kanya Kumari, the southernmost tip of the Indian peninsula. The present writer had the pleasure and privilege of accompanying this band of Divine servants on trip, Alhamdulillah. From the sights and sounds we encountered and through the conversations and interactions we have had with a number of people during the journey, it is humbling to realize that we became far more self-aware, Soumma Alhamdulillah. The evil eye is a reality against which we can protect ourselves. Thus, it is our duty to be aware of this fact in order to be able to fight it, Insha-Allah. So we will explain what the evil eye is before addressing the ways in which we can protect ourselves, Insha-Allah. What is the evil eye? The evil eye is defined as the consequence when the soul arouses a persistent or malicious desire to meet or to see (stare at) a person. So the evil eye takes place when one looks with envy and insistence on a person. The evil eye can even reach a good, even a being or an entity belonging to the mineral, animal or agricultural world. Moreover, the look that one carries with insistence and wonder on a person or a thing has an effect on them. 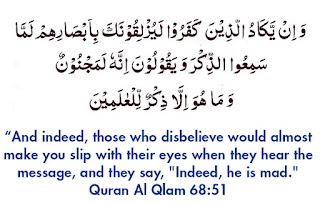 Allah says: “The disbelievers would almost cut you down with their eyes when they hear (you recite) the Reminder (i.e. the Quran).” (Al-Qalam, 68: 52). 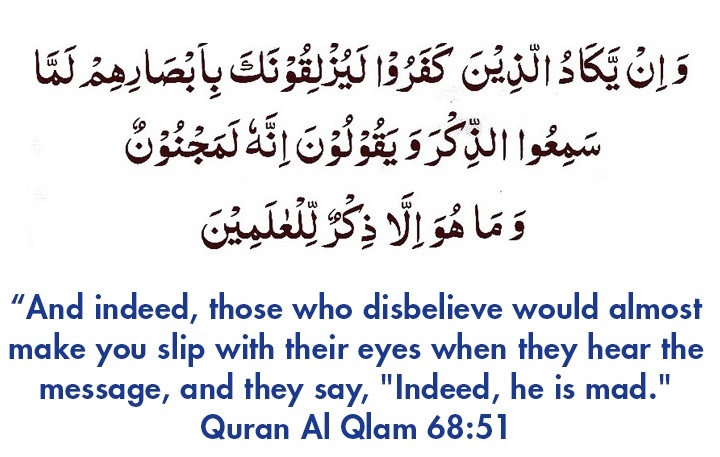 A Quranic verse can have many connotations and for our present subject, it also affirms that it can mean the evil eye. The disbelievers wished to touch the Messenger of Allah (pbuh) with the evil eye, and besides our beloved prophet (pbuh) has left us an enriching inheritance by warning us against the evil eye and the evil of the evil one (i.e., Satan the accursed one). According to a Hadith narrated by Ibn Abbas (ra), the Messenger of Allah (pbuh) said: “The evil eye is a truth, if there is one thing that precedes predestination, it would be the evil eye ...” (Muslim, Ahmad & Tirmidhi). It is very important to emphasize the importance of protection against the evil eye. We know that this reality is dangerous for us because the Messenger of Allah (pbuh) used to seek divine protection from the evil eye. Indeed, Abu Said (ra) reported, “The Prophet (pbuh) used to ask for protection from the evil eye of the human being.” (Tirmidhi). This proves to us that the evil eye is a reality that represents an evil for us and from which we must preserve ourselves. 1. The first way is to take refuge with Allah and ask for His protection against the evil of the envious. In Surah Al-Falaq (Chapter 113), we find the request for protection against the evil of the envious. Indeed, Allah says: “Say: I seek refuge with the Lord of the Dawn, from the evil of that which He created; from the mischief of Darkness as it overspreads; and from the evil of those who spit on the knots, (i.e., perform malignant witchcraft). And from the evil of the envious when he envies.” The last evil against which we can seek the protection of Allah is evil linked to the evil eye. It is up to us to implore divine protection against such evil! Anger/ Wrath - not to be confused with the divine wrath or the wrath that Allah makes appear on the features of His Messenger as a sign of disapproval of the actions of believers and also that of the unbelievers - is a factor through which the Devil brings men to commit sins such as insult, breaking relationships, physical aggression, or even to commit the irreparable, i.e. murder. So we have to be able to control our anger so that we do not commit such serious sins. Allah says about the “Muttaqi”, i.e. those who repress their anger, in Chapter 3 (Al-Imran), Verse 135: “[...] those who restrain (their) anger and forgive the people [...]”. Therefore, the Muttaqi - those to whom Allah will offer paradise - are those who control their anger, who despite their strength and courage manage to forgive those who have wronged them. To control our anger is to preserve Islam. 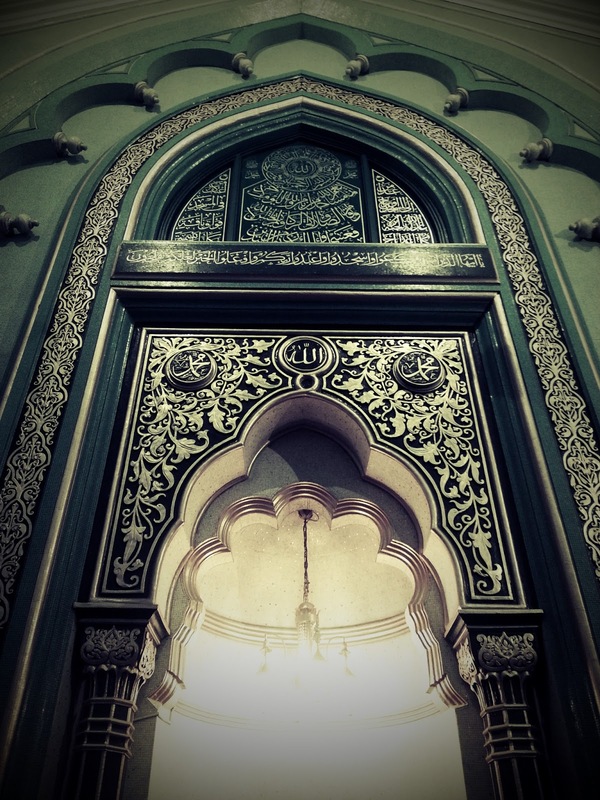 The repressing of our anger allows us to practice Islam in the best way. As long as a person manages to control his anger, his faith will be preserved. However, if the person gets carried away by anger, it will bring him nothing but regrets. “Why did I say / do that?” he will ask himself. The Messenger of Allah said, “Whosoever represses his anger when he can give free rein to it, Allah will call him on the Day of Resurrection before all creatures and invite him to choose one of the Houris who shall please him.” (Abu Dawud). Islam's normative injunctions are all designed to foster freedom and justice and to promote a just social order. Its moral universe is informed by the Living Presence of Allah (swt), to whom people are responsible individually and collectively as a group- sect, religion, tribe, clan, nation, community, etc. - and are bound to account for their acts and omissions on the Day of Judgement. Several verses in the Qur'an affirms the inherent freedom of choice in people: "Had your Lord willed, all the people on earth would have believed. So can you (Prophet) compel people to believe? It is not for a soul to believe , save by God's Leave" (10: 99-100). 'Say, Now the truth has come from you Lord: let those who wish to believe in it do so, and let those those who wish to reject it do so' (18: 30). 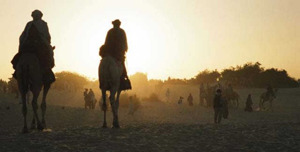 Life in Arabia during the Holy Prophet's time also produced within its varied contingencies complex questions of freedom of choice in faith matters. 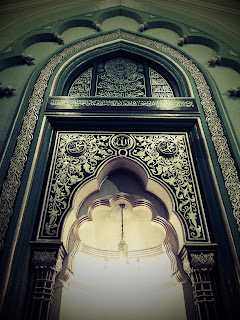 Some of the Muslim parents had a dilemma: whether to force their children to join the then nascent Muslim community; or to respect the children's choice of joining their foster- parents' clan (Jewish tribe- Banu Nadir that was leaving from Madinah and some also wishing to join Christian merchants going to Syria). It might seem astonishing to some; but the Qur'anic verse-"There is no compulsion in religion" (2: 257) was originally revealed to ensure the freedom of choice of the people who wished to leave Islam against the wishes of their Muslim families! Even as Islam commands freedom of conscience and respects the right of people to make choices, it also allows resistance to oppression and injustice and to wage wars in self-defence in compelling political circumstances. What is not required or unjustified in general conditions of life, may gain validity of law and practice in exceptional circumstances. Necessity, proportionality, fairness and even-handed dealings are central to Islamic ethics, and the 'text' of moral injunctions need to be seen in the 'context' of the evolving circumstances of the Muslim life. Muslim Ulema who celebrate the 'cult of sword' in the name of Jihad/preaching of Islam are grossly misguided in reading the text without knowing its context. 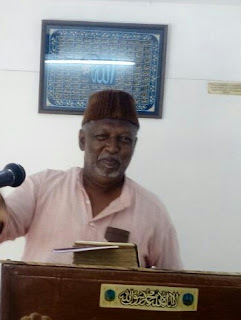 Their ill-considered views are detrimental to the fair name and legacy of Islam as a religion that appeals to human conscience and secular reasoning in equal measure. In his first Friday Sermon of the New Year- on 5th January 2018, Hadhrat Khalifatullah (atba) expounds profoundly on freedom of choice from a Qur'anic perspective and corrects the doctrinal mistakes of the Muslim Ulema on this vital question. 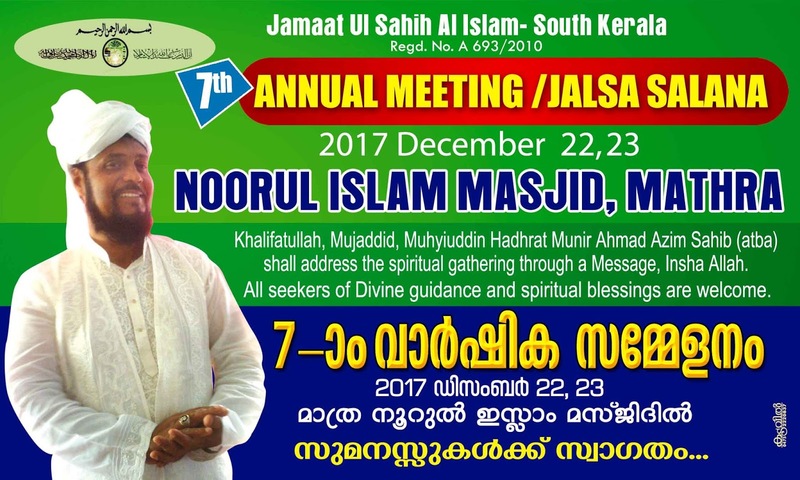 Jamaat Ul Sahih Al Islam- South Kerala organized its Seventh Jalsa Salana at Noor’ul Islam Masjid, Mathra, 22-23 December 2017. Brothers from Alappuzha, Kaliyikkavila and also from Delhi, reached ahead of the commencement of the two-day programme. 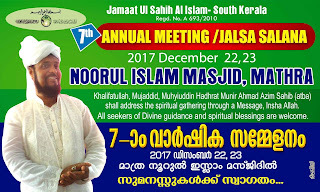 The first day of the Jalsa, 22nd December 2017, all brothers and sisters collectively offered the Tahajjud prayers and it was followed later by the Namaz-e-Fajr. 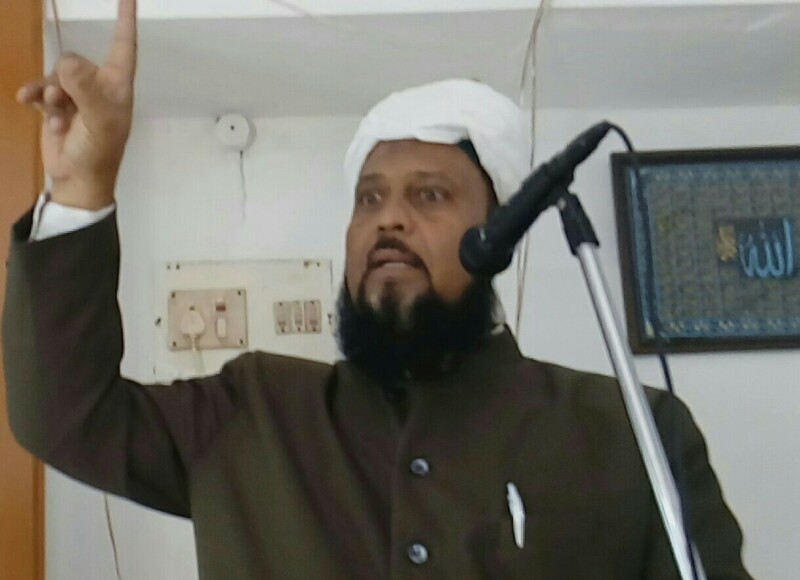 Mukarram Amir Jamaluddin Saheb conducted a Dars-e-Qur’an, immediately after the Fajr Namaz. 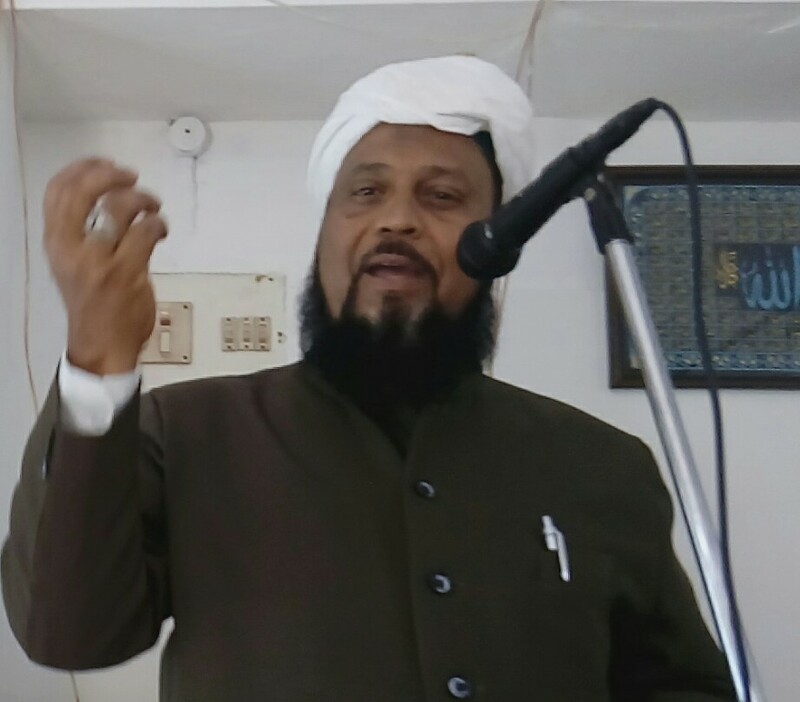 At 11.00 a.m, the members assembled for the Inaugural Session, with Hazrat Mukarram Fazil Jamal Saheb delivering a speech “on the importance of Jalsa Salana”. The discourse was based on a sermon delivered originally at the opening session of the Mauritius Jalsa earlier this year, by our beloved Imam Hadhrat Khalifatullah (atba), containing useful advices to think through our spiritual duties and practical ways to create a new world of spirituality with the advent of the new Divine Manifestation. The spiritual journey is a life-long journey. Various stages of progress and development during the course of this journey may be described as achievements but the fact is that ultimate distinction and goal of this journey is never to be achieved in its totality. There is always a stage beyond the highest point of achievement and there is always a peak higher than that we set our feet upon. This has to be like that for the simple reason that in this spiritual journey we travel and ascend towards God whose infinite Being is, strictly speaking, beyond human comprehension. Allah clearly states: Eyes cannot reach Him but He reaches the eyes. And He is the Incomprehensible, the All-Aware. (Al-Anam 6: 104). Every day he reveals Himself in a different state. (Ar-Rahman 55: 30).